Important elements of the drinking water supply. 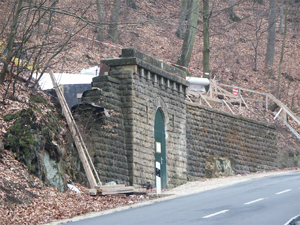 The old “Water Cas­tle” (ele­vat­ed tank) in Sen­ninger­berg. 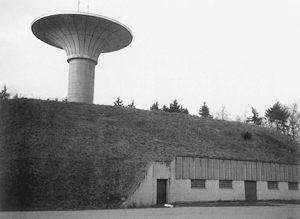 Since 1914, the drink­ing water sup­ply of Nieder­an­ven was guar­an­teed by the com­mu­ni­ty dis­tri­b­u­tion sys­tem. The first step con­sist­ed in gath­er­ing the waters of some local springs of Hostert, Sen­nin­gen and Ramel­dan­ge at a cen­tral place from where they had been trans­port­ed to the tanks of the dif­fer­ent local­i­ties. The dis­tri­b­u­tion sys­tem of Nieder­an­ven includ­ed the vil­lages of Sen­nin­gen, Nieder­an­ven, Hostert, Ramel­dan­ge, Ober­an­ven, Ern­ster and Sen­ninger­berg and also the ham­lets of Engelshof and Jäger­häus­gen. Over the years a com­pli­cat­ed and expand­ing net­work of in-between and addi­tion­al con­ducts relat­ed the drink­ing water sup­ply dis­tri­b­u­tion of the dif­fer­ent vil­lages. 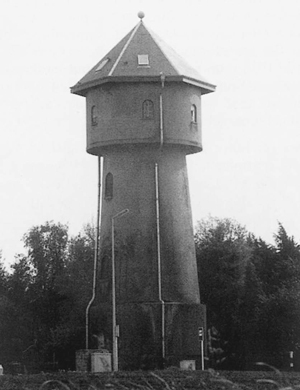 The water tank in the “Bin­newé”. The tank of Sen­nin­gen-Nieder­an­ven could be eas­i­ly sup­plied with­out the help of mechan­i­cal means, because of the favourable posi­tion of the sources. In Hostert how­ev­er, where the sources can only be found on a much deep­er under­ground level,the water had to be pumped to the high­er locat­ed tank in the “Bin­newé” with the help of a spe­cial pump­ing sta­tion, the “Wid­der­haus”. Since 1973, the water sup­ply for Hostert is guar­an­teed by the con­nec­tion to the emer­gency tank of the SEBES (Société des Eaux du Bar­rage d’Esch-sur-Sûre). 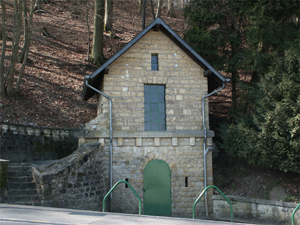 The new water tank (called “mush­room”) in Sen­ninger­berg. In 1936 the old pump­ing sta­tion had been replaced by a mod­ern and larg­er elec­tric one. Lat­er in 1990, an even larg­er had been con­struct­ed near the entrance of the ceme­tery.